Jibokjae (Hangul: 집옥재; Hanja: 集玉齋), located next to Geoncheonggung Residence, is a two-story private library used by King Gojong. 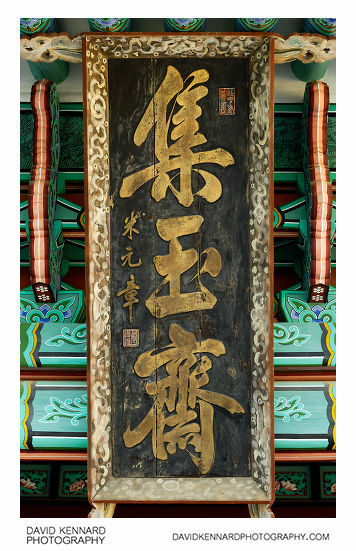 In 1876, a major fire occurred in Gyeongbokgung Palace, and King Gojong, for a brief period, moved and resided in Changdeokgung Palace instead. He eventually moved back to Gyeongbokgung in 1888, and he had the already-existing Jibokjae building dissembled and moved from Changdeokgung to the present location in 1891. 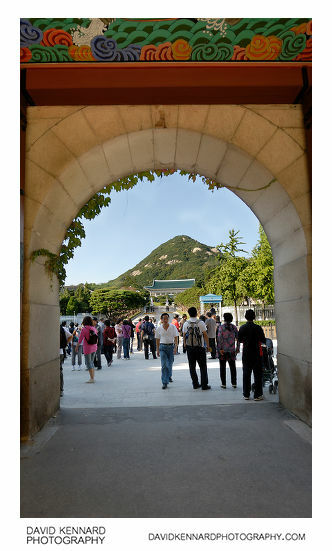 Its name, Jibokjae, translates loosely in English as "Hall of Collecting Jade." The building uniquely shows heavy influence of Chinese architecture instead of traditional Korean palace architecture. 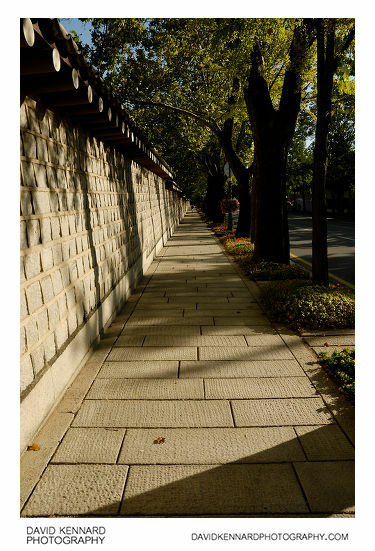 Its side walls were entirely constructed of brick, a method commonly employed by the contemporary Chinese, and its roof design, interior screens, and columns also show Chinese influence. Its architecture possibly was meant to give it an exotic appearance. Jibokjae is flanked by Parujeong (Hangul: 팔우정; Hanja: 八隅亭), an octagonal two-story pavilion, to the left and Hyeopgildang (Hangul: 협길당; Hanja: 協吉堂) to the right. Parujeong was constructed and used to store books, while Hyeopgildang served as a part of Jibokjae. 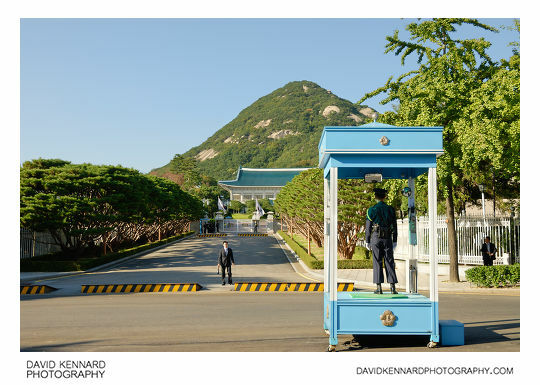 Both of the buildings are connected to Jibokjae by internal corridors. 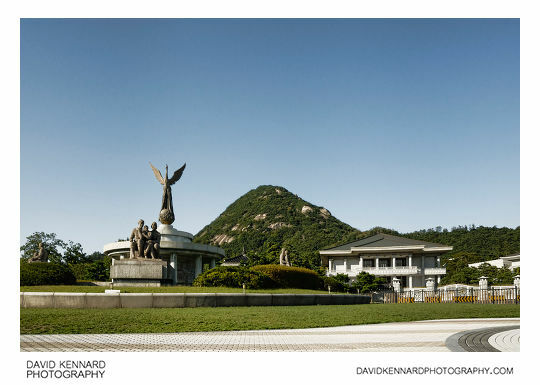 Bohyeondang (Hangul: 보현당; Hanja: 寶賢堂) and Gahoejeong (Hangul: 가회정; Hanja: 嘉會亭), buildings that also formed a library complex to the south of Jibokjae, were demolished by the Japanese government in the early 20th century. 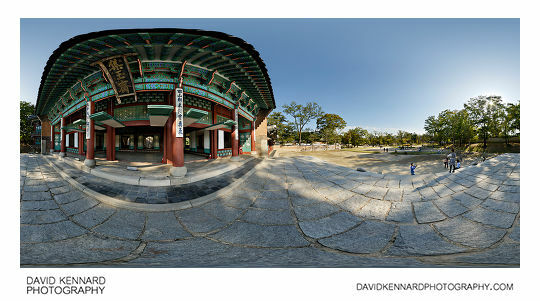 To get the inside of Jibokjae up to a reasonable light level I shot the full pano (6 shots around, 1 up, 1 down), bracketed ±1EV, and took another set of shots of Jibokjae, but with the shutter speed two stops slower (and again bracketed ±1EV). Then I merged all the exposures in Photoshop. 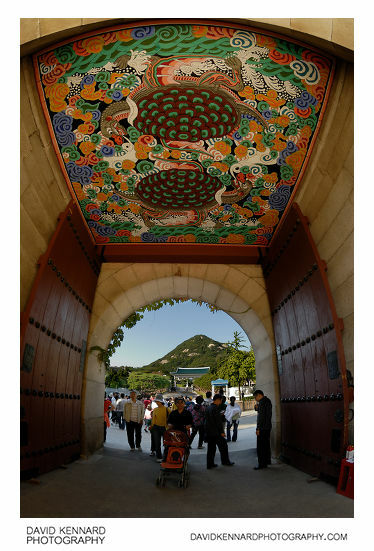 The roof of Sinmumun is decorated with an image of two turtles, and through the gate can be seen Bukhansan (북한산), the highest mountain in Seoul, and Cheong Wa Dae, the presidential complex. 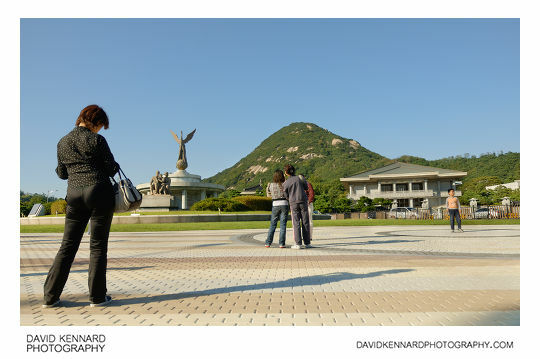 Due to its close proximity to Cheong Wa Dae, Sinmumun was closed for a long time, but it was opened to the public in 2006 at the insistence of then president Roh Moo-hyun. Going through Sinmumun you can glimpse Cheong Wa Dae or 'The Blue House' as it is known, due to the blue colours of the tiles used on the main building's roof. 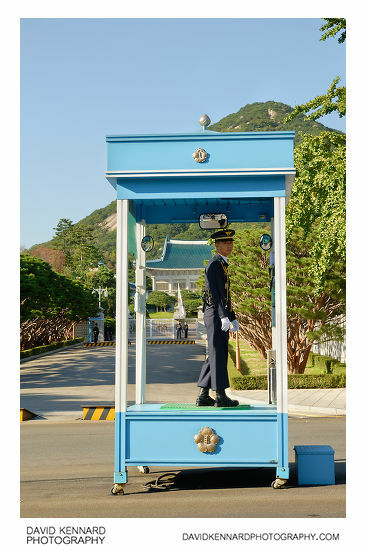 A portable guard box is on the road outside the entrance to Cheong Wa Dae, presumably to keep the guard dry when it rains. Walking west along the road at the north of Gyeongbokgung, we came to this large area, still near the presidential complex, and with lots of guards around. There were quite a few tourists around this area.